Barbara Guest’s author notes page here on the Jacket site offers a biographical note, and also links to a dozen or so Jacket pages that feature her work or reviews of her books, or where she is interviewed. 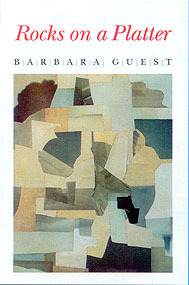 Barbara Guest's latest book of poetry, Rocks on a Platter, is certainly among the most original of her distinguished career. Turning eighty this year, she has delivered a book which explores the nature of her art with untiring rigor, a dazzling breadth of cultural knowledge, and a touch that is intellectually thorough and artistically fine-tuned. Rocks on a Platter is subtitled Notes on Literature, a subtitle which does justice to the various directions the book takes: it is a smorgasbord of poetics. But the subtitle could be read to refer to "notes of music" as well, and the book is a sort of sonata for language, whose four sections are each movements. 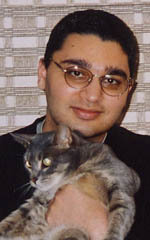 Indeed, Guest writes in section IV, "compose, like Schoenberg, poem music"; Schoenberg is a central motif in the book. This book is very much a book in the sense that it is not an arbitrary selection of poems, but a flow of pages, each scored as carefully as Mallarmé's "Un coup de dés," reminding us that in much avante-garde writing it is the page as much as the line that has become the element of composition. Moreover, the book is a self-contained unity, so fused in fact that one must deconstruct synchronicity and diachronicity to read it properly: certain ideas are introduced in section I, for example, whose meanings are only clear once the reader has read section IV. Such ideas receive further clarification from other pages in the book, and epigraphs do not delimit boundaries. In her "Contents" page, Guest titles each section with its first line, but we would do well to read the epigraphs as very much clues to the poetry, and especially the epigraph to the first section from Holderlin: "To live is to defend a form . . ."
Form becomes an issue in Guest's notion of the "Literature" she is annotating, and we know what an issue form was for the moderns and post-moderns, especially free verse, constructivism, and the idea of open-form. Schoenberg is important here. Guest alludes to him four times, and their projects and their approaches to modernism are similar. Guest has obviously elected him as a kindred spirit. In "Theory of Form" Schoenberg writes "One will have to designate as the highest forms those in which the presentation is concise, comprehensive and exhaustive, the richness of discovered relationships to the subject impressive, the elimination of inessentials carried through consistently and uncompromisingly, and yet the presentation suited to taste." We have an important qualification in his "Tonality and Form" - "Artistic expression does not depend on any technical trick, but lies rather in musical thought itself." Guest defends the idea of form fearlessly, as the intricacies of the musical patterning of her poetry demonstrate; but music is always present in her work as a mode of expressing thought. Ideas. As they find themselves. In trees? to approach this land raving! Rocks, platter, words, words . . . This is almost algebraic in its perfection. We begin with ideas. We are reminded of Hegel's theory of beauty in art as the sensuous appearance of the idea (and indeed, Guest will draw an epigraph from Hegel later), as well as William Carlos Williams's dictum "no ideas but in things." "As they find themselves." Hegel's problematic Romanticism is bypassed with this post-Romantic announcement of the idea, in the field of the poem, as something independent of the human mind. "In trees?" is an arbitrary sensuous image of dissonance, in the Modernist array of objects. The next sentence is Hegelian in its evocation of history. "Dreams set by typography" introduces a theme that could almost be Freudian, literature as dream, and typography of course refers to the words constituting the literary in themselves. We are not yet ready for the shipwreck motif, but we cannot fail to notice the appearance of the title words: "Rocks, platter, words, words..." The title is immediately associated with language, with "words, words," the words in the book which will build up, in a constructivist style, the title of the book. What are the "Rocks, platter?" Clearly, this is not a conceit in the Eliotic sense, not meant to be delved into for a deeper meaning; rather, the rocks on the platter are pure image, and the book itself is the conceit developing it as idea. In italics the platter has found its way to itself, as previously considered words are considered and rejected, (other factors will find completion in the final section too). The second page introduces another important notion in the book: the parable of the king, in which Guest narrates the story of a girl and "kitchen maids," each of whom gives the king a story, one, titled "Baked Apples" which the king rewards with an apple tree, another, the "kitchen maids'" titled "Jonquil Tales," which the king dislikes, but to whose authors he donates chairs for a film house they establish instead. Literature is established as the king's art, though he has ties to film, and indeed Guest will write of montage, "a new elevation" (IV), reminding us of collage as the preferred instrument of the literary avante-garde, with overtones of film technique. And the king? We find out about his authority in the epigraph to III and in a passage in IV. The epigraph to III is Hegel's, no surprise considering Guest's opening: "... the empirical inner and outer world is just what is not the world of genuine reality, but is to be entitled a mere appearance more strictly than is true of art, and a crueller deception." The relevant line in section IV is, "naming the throne, 'flotsam of appearance,'." The rationale for the shipwreck imagery on the first page is now clarified. The "throne" is the metonymy for the crueller world of appearances whose shipwreck he rules, who authorizes art mimetically. He is opposed to "BEAUTY...sweet reproach of invisibility" (I), the invisibility of the literary domain that is, in the very last words of section I, "'afloat with the telling'" of poetry. As the book continues, Guest painstakingly develops and adumbrates the above theme of mimesis, the "flotsam of appearance." The girl's hair, transformed in mimesis, fills "some other body," on the artistic plane. Guest has other concerns in these "Notes on Literature". We have seen her treatment of history in her opening page, and her escape from Romanticism in her opening line. The passage from Romanticism to Modernism reemerges later in the book. "Mount Blanc Childe Harold," Guest utters in section III. Keats's urn will turn up: "Bittersweet and decisive/when showed a technique/of maintenance in the dark field of modernly," reinterpreted in a conclusive section IV, "modernly." The "modernly" echoes (and there are many echoes in this book) "Shattered Rocks...Rays modern rays/modernly, so be it" from section I. Guest is leaving room for the inclusion of her Romantic forbears in her "Rocks", whom, Hegel among them, she needs, but bypassing them into modernity, in dialectical fashion. One cannot read Rocks without emphasizing that this is a book about its own assemblage. We have seen this on the first page: "Rocks, platter, words, words..." "Shattered Rocks...Noise of the Shattering! "(I) Guest exclaims at one point in her composition, in an almost religious ecstasy. Guest is referring to her tree of ideas on the opening pages, then to the words in which ideas are cultivated. Indeed, the book is a labyrinth of cross-references and self-referentiality, more complex than nucleic acids. An epigraph by Samuel Johnson, to section II, further illuminates Guest's poetics: "To invest abstract ideas with form and animate them with activity has always been the right of poetry..." Form makes its appearance again, as does the Hegelian theme of the idea. Animation reminds us of music. All of this makes sense in looking at Rocks as a whole. It would be interesting to compare this to another quotation from Hegel, from whom Guest, as we remember, took her epigraph to section III. Here is Hegel, from his Introductory Lectures on Aesthetics: "As regards the third and most spiritual mode of representation of the romantic art-type, we must look for it in poetry. Its characteristic peculiarity lies in the power with which it subjects the mind and to its ideas the sensuous element from which music and painting in their degree began to liberate art. For sound...is in it no longer the feeling of the sonorous itself, but is a sign." Of course, for Hegel, the "spiritual" meant the intellectual, and the "romantic" spelled the end of art in the triumph of the intellectual. But Guest has recuperated Hegel for post-Romantic poetry. She also, of course, knows the difference between music and poetry - further distinguishing her poetics - as her epigraph from Johnson and her Hegelianism shows: poetry involves itself with the idea, with the sign. One is reminded of the fourth epigraph, the Dolphin appearing in the Heraclitean dialectical flow, which is the dialectical flow of the book. The Dolphin will reappear: "snowy apricot furnace/of the dolphin", Guest writes, describing the poesis of the poem. By the poem's end, this symbol for the sign transposed by imagination has become "The Dolphin God - does he swim on the page?" Guest elaborates this with her last words, given, like her first, to that Romantic, Holderlin, "In ancient times Heavenly Beings made sense of themselves and how they made off with the strength of the Gods." Guest is addressing both Holderlin and Hegel here in her "Notes on Literature." Does the "Dolphin" swim on the page as a god (the question mark is almost misplaced - is the dolphin divine)? In any case, she is questioning Hegel's granting superior status to religion over literature. Meanwhile, she has let us know that her dolphin, the creative sign, has swum, in defense of form, over the waters of time, amongst the "flotsam of appearance," over the pages of her meticulous, musical, miraculous book.